Should Boston schools get rid of busing? Some say the money would be better spent in classrooms, but the answer is not clear. Here’s why. 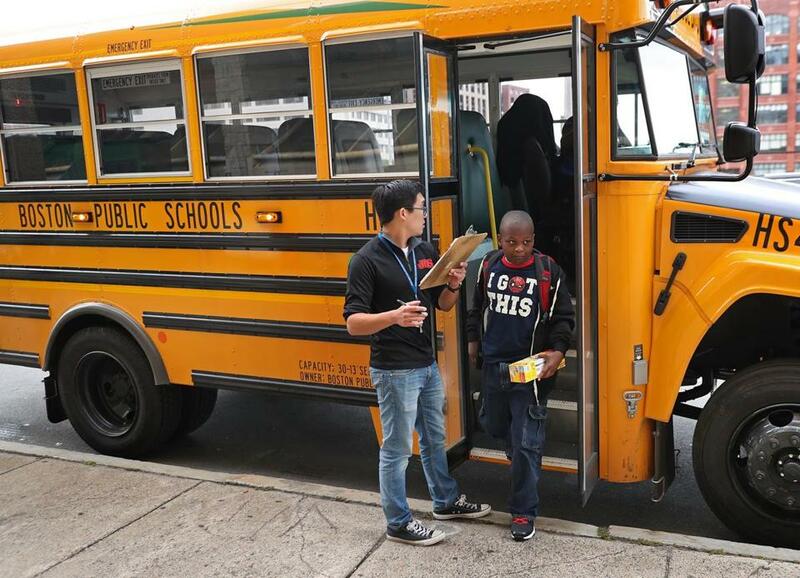 The Boston School Department spent $122.5 million on school transportation last school year. In a city where school buses criss-cross neighborhoods, taking some students to high-performing schools but too many others to lackluster ones, some city and school officials are now raising one of the most contentious questions since the days of court-ordered desegregation: Should Boston get rid of busing? City Councilor Annissa Essaibi George has been the most vocal, taking to social media last week, exclaiming, “Those dollars would be better spent in the classroom, directly supporting kids!” Boston School Committee Chairman Michael Loconto raised a similar point during a School Committee meeting, noting Boston has among the highest per-student busing costs in the nation. The city spent $122.5 million on school transportation last school year. Busing students across the city has been the subject of bruising debates over four decades in Boston. The discussion intensified last week in the wake of a new report by Northeastern University that revealed a four-year-old computerized system used to assign students to schools is exacerbating segregation and leaving many black and Latino students in low-performing schools, even though tens of thousands of students get bused every day. The findings have created immense frustration for city and school officials who had hoped the assignment system, which affects kindergarten through grade eight, would allow more students to attend quality schools close to home, in an effort to simplify the assignment process and save on busing costs. But the unfortunate reality is that Boston has too few good schools to go around. For that reason, many parents, elected officials, and school leaders remain adamantly opposed to eliminating busing. Among them: Miren Uriarte, a School Committee member, who criticized Loconto’s suggestion during last week’s meeting. “What that means is there is going to be more and more segregated schools. If we are willing to live with that, then we will go in that direction, [but] I’m not willing to live with that,” said Uriarte, eliciting cheers from some parents and advocates in the audience. For many families, the yellow buses represent opportunity for a better education in another neighborhood. But many other students wind up at schools no better than the ones they pass by. The latter fact irks some politicians, educators, and parents, who contend the school system’s transportation budget is too high and complain about inefficiencies, such as late-arriving school buses. A frustrated City Council for the past few years has pressured the school system to reduce costs, but spending has nevertheless increased. Yet if school officials were to try to eliminate busing under its school assignment plan, they would not wind up with $122.5 million at their disposal, according to budget figures. That’s because most of the transportation budget covers expenses mandated by the federal and state governments, such as busing special education and homeless students and transporting other students to charter, parochial, and private schools. Busing under the school assignment plan ultimately accounted for just $37 million last year. And even if the city moved to neighborhood schools, it would still need to shuttle students across neighborhoods because some areas do not have enough schools for all students who live there while other parts have too many schools and not enough kids. How much would actually be saved remains anyone’s guess. Essaibi George, who chairs the council’s education committee, said she realizes that a lot of the transportation spending would need to remain in place, but she believes if more students were allowed to attend nearby schools, then more money would be available to improve school quality. Giving schools even an additional half-million dollars apiece could go a long way in helping them restore programs and positions lost under budget cutting, while also ensuring schools have full-time nurses and behavioral and mental health specialists, she said. Essaibi George said she would like the school assignment system overhauled by January. Loconto hit that point during last week’s School Committee meeting, also noting that the school system will necessarily have inherent segregation when students of color comprise 87 percent of enrollment. Loconto later said in an interview he hasn’t taken a position on neighborhood schools. On Tuesday the School Department issued a statement indicating that it will look to improve the current assignment system and boost the number of high-quality schools. Mayor Martin J. Walsh’s office deferred comment to the school system. Matt Cregor, education project director at the Lawyers’ Committee for Civil Rights and Economic Justice, said going back to neighborhood schools would contradict the landmark ruling in Brown v. the Board of Education. To that end, the researchers from the Boston Area Research Initiative at Northeastern University, which examined the school assignment system, recommended altering the assignment system to even the competitive playing field for getting into the limited number of high-quality schools. Their suggestion: Families in neighborhoods with high densities of children should get more high-quality schools to apply to. Currently, many high-performing schools are located in more affluent sections where fewer students live, giving those families a competitive advantage under an assignment system that favors applicants who reside near a school. Yet the recommendation could add to transportation costs if more students win admission to high-quality schools outside their neighborhoods. Some families say the conundrum is a consequence of the failure to improve school quality in the neighborhoods that need strong educational options the most. Cheyvonne Roberts said the buses have provided better educational opportunities for two of her grandchildren, taking them from Mattapan and Roxbury to a high-performing school in Brighton.